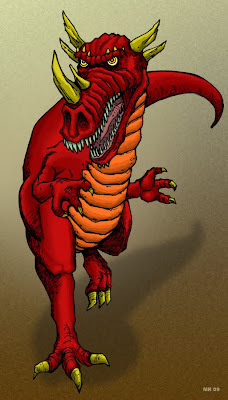 Chronodrakes are gigantic, dinosaur-like dragons which have a latent ability to time travel. They tend to "blink" though different time periods depending on environmental conditions, the same way many animals migrate in different seasons. Chronodrakes have also been known to spontanesouly blink away when faced with life threatening danger. Reports of such monsters come from many different time periods from a wide array of ancient cultures - Egyptians, Assyrians, Vikings, Greeks, etc.